The EcoSchool concept is about making educational material available to students at a lower cost and much more conveniently than traditional methods like physical books, sit in lectures, library visits, download of pirate copy books, travelling around the globe for education etc.. 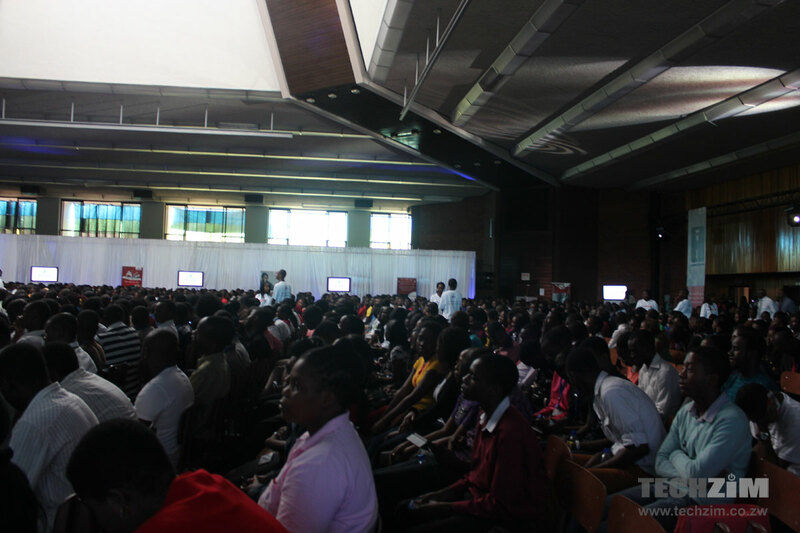 The concept evolves around a tablet that the company will sell at its Econet shops, as well as booths at university campuses like the UZ. As indicated in the morning, Econet has partnered biNu and WorldReader. But they also have other partners like, Wolters Kluwe, Wiley-Blackwell, Elsevier (all publishers) and the University of Zimbabwe. The company is starting with a pilot which will run for 4 months. As part of the pilot, students at the university of Zimbabwe will get the tablet free when they register for the the service. Eventually though, the tablet will cost students $20 a year for 3 years. As part of the pilot, students will pay $5 a month for access to the textbooks and course material, as well as certain ‘free’ sites (well, you have paid $5) like codecademy, the university sites etc… we’re guessing these sites. After the pilot the model will be: students buy EcoSchool credits which they use to buy data and material on the platform. Econet Services CEO, Darlington Mandivenga said books will be at least 40% cheaper than their print counterparts. Access to certain sites will still be free. The service is limited to students, that is you will actually need a student ID card to buy one. The tablet available so far is a 7-inch tablet running Android ICS (4.0.4). 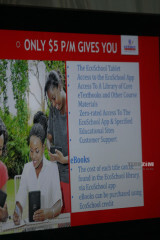 Ads indicated in the morning, its basically a standard Android tablet with the EcoSchool app pre-installed. 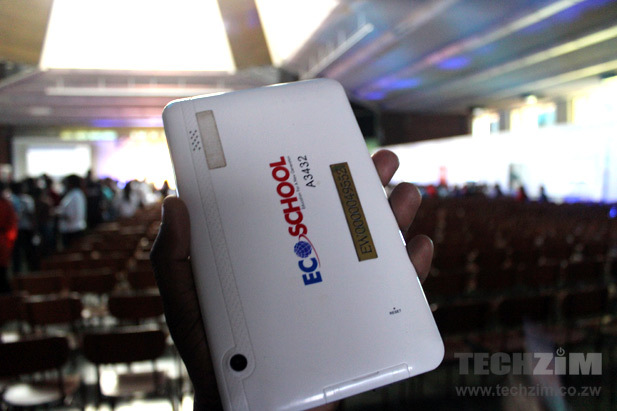 the business model of the eschool tablet is not a solution to the problems of textbooks in the Zimbabwean education sector which mainly revolve around cost. what we need is a self publishing platform that delivers books from the author straight to the reader without a middleman (publisher) or being platform dependent. the issue of quality can be catered for in the app by having editors offer their services to authors in the self publishing platform. The books should be affordable say usd5 and available in pdf/html formats with total ownership. 4. The authors should then rely on economies of scale to make a profit. 5. Revisions to the book should then be made available for free to those books that are non-pirated copies. I concur. If the cost is too high, piracy will abound. Books will similarly be affected by whatever woes are currently bedeviling the sales in musical CDs and DVDs. I have been trying to say the same thing but you said it better than I ever said. Academics should work together with developers and get this started. This EcoSchool initiative though commendable, I don’t know how it will help students in the rural areas and those who can’t afford the said costs. 40% percent cheaper is still expensive for an electronic version of educational material. if they are going to be offering access to Coursera and Udacity for free, I am not going to think twice about this product…definitely going for it ….thumbs up to Econet…..Definitley a huge leap in the right direction…..
Me sees a very nice revenue stream for authors…. Why not release your textbooks as apps. This apps can be downloaded from the Google Playstore or uploaded manually. Students can share the APKs, you could give teachers the apks for free… But here comes the magic part…………………..
Once downloaded the app has to be activated. The app will refuse to open the content unless its activated. You can then sell activation codes using whatsapp, sms, website. After a year….the app expires and has to be renewed. This will definitely reduce copy right infringement. People are already selling books in the playstore. Nice idea! For local academic content it has to meet certain standards; it won’t be ideal just to have people publish for the sake of a quick buck, but your idea is noble, it just needs the proper quality control and monitoring. 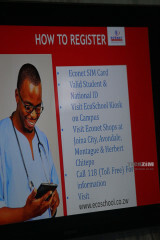 this is a very good initiative Econet towards the development of Zimbabwean education. My question is to the management that will be monitoring the $20 annual fee for the tablet, What if a student drops out of school without finishing the 3 years as per agreement. This is why I think that 3 years is too long a period to pay off the tablet’s initial price. I would suggest 1 year to be implementated and the pay offs to be done on a semester basis when a student will be paying his/her fees. this will ensure security to Econet as an organization. as a student I am happy because spending hours in the library reading irrelevant books in not my thing at all. so they steal this idea from kenya again..
its like you go into a shop to find bread, then u only see tomatoes which have been dug up.. what im trying to sae is Rumbie is right .